If you haven’t seen Opus No 7 and you still have an opportunity to, stop reading now. There’s not really a plot as such to spoil, but the below will unavoidably outline some of the images that gain so much of their power from surprise. So be warned. Dmitry Krymov has a talent for making the ordinary appear strange, for transforming the familiar into the singular. Limbs explode from cardboard walls, startlingly divorced from the bodies that own them. Splashes of black paint morph into shadowy figures. 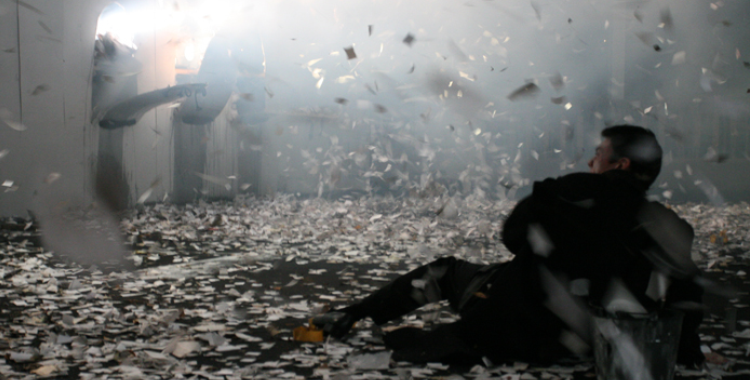 A blizzard of newspaper scraps conjures debris one moment and confetti the next. The dead hold hands with the living. The inanimate is given life. Image bursts into reality and reality solidifies into image. Opus No 7, the designer turned director’s latest production, is a dazzling procession of such transformations. So composed is it of images, the performance does not yield willingly to language. As elusive as it is astonishing, its qualities slip from the critical grasp – shape-shifting, like Krymov’s captivating pictures, just as the mind begins to outline them. This is theatre made for feeling, not thinking. There is a structure of sorts, though this too is elusive. The first half, Genealogy, yawns with loss. In it, a group of figures sift through fragments of history, clutching at names, photographs, items of clothing. Phoenix-like, they move among the ashes of the past. Though abstract, the scenes allude in their haunting imagery to the Holocaust – but strikingly unshackled from the now familiar visual markers that history has attached to it. In its sudden, surprising evocation of loss, there is something inexplicably moving about a performer walking along a pair of tiny red shoes by their laces, or a cardboard arm suddenly reaching up to take that same performer’s hand. The second half offers us a visual biography of composer Dmitry Shostakovich, who we see first nurtured and then smothered by an oppressive Mother Russia. 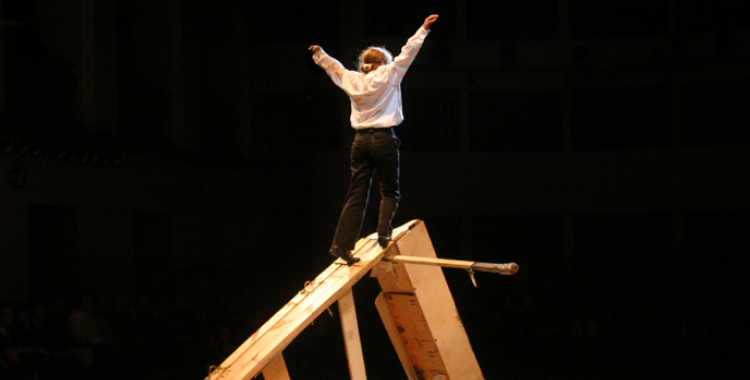 As a child-like figure at the opening of the act, hugging to Mother Russia’s skirts, the wooden skeleton of a piano is Shostakovich’s climbing frame, his creativity given free and playful rein. But the same power that initially encouraged the composer later ensnares him, pinning a medal on his chest that stabs him through the heart. As Soviet repression and censorship reaches its height, Mother Russia pulls the trigger on her artists and the piano bursts into flame. Fittingly, given the subject of the second act, Opus No 7 operates more like music than theatre. It is, for a start, largely wordless. There are echoes and refrains: the chilling tread of an SS officer in the first half becomes the boot of Mother Russia – realised as a huge and often terrifying puppet – in the second. Silence and stillness are juxtaposed with furious flurries of activity, as pitch and tempo both fluctuate. The theatrical crescendo, as rusty pianos invade the stage and crash violently into one another, is powerful as much for the accompaniment of Shostakovich’s “Symphony No 7” as it is for what we see. And the performance provoked in me the kind of raw, visceral, emotional response that I more readily associate with music – and, interestingly, with visual art – than with theatre. When I walk around a gallery or listen to a piece of music, my reaction (at least my first reaction) is instinctive rather than cerebral. If I really, really love a painting or a sculpture or a song, the feeling it stirs is perhaps best described as an ache; pleasure bruised with just a hint of pain. Opus No 7 leaves behind that same sort of ache. At one point during the first half, I remember thinking: there’s too much. Not, I should hastily add, in a negative way. At the Barbican, we are seated on the stage of the main theatre, thrillingly close to the action. It is a wide, wide stage. Placed right up close to the performance, it is therefore impossible to take in everything that is happening at one time – the playing space is just too big. The experience of watching, then, is to a degree overwhelming. And I wonder if this is part of its power. Like the aesthetic sublime, it is too much to take in at once, to comprehend as a whole. For that reason, it both awes and captivates. Watching theatre like this, I’m aware more than ever of the visual poverty of so much of what we see on Britain’s stages. Where, apart from a scattering of bold efforts, is our designer-led theatre? The visual, as Krymov and his team prove, can be just as eloquent as the verbal. Opus No 7 is no less rich for its scarcity of language; ideas, though slippery, still move under its mesmerising surface of unforgettable images. The impact is indescribable, yet indelible.